Bit blurry...but all I can say is - what a difference 26 weeks makes. Yes, today marks 6 months of WW. I haven't lost anything this week, but I thought I should celebrate sticking with the plan for so long. Physically, I feel more comfortable in my own skin, although I have become more critical of my appearance. But the changes in appearance are nothing compared to how my internal workings are running and the health implications I had from carrying the excess weight. My BMI was originally in the morbidly obese category at 42. 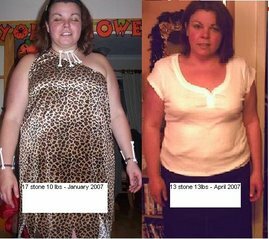 By losing a third of my 248lb frame, I have cut my risk of Type 2 diabetes, coronary heart disease and all but eliminated my joint and back pains. Shapewise, my body has transformed and I actually feel like I have a shape...oh and I can SEE my toes for the first time in years! My chest has decreased from 48" to 43". My waist has gone from 43" to 35". My hips have shrunk from 51" to 43". As for my thunderthighs, they have gone from 28" each to 24.5"....so that would be an inch loss of 28". I know the next 26 weeks will not be anywhere near as easy as the first 26, but I can see the end in sight. 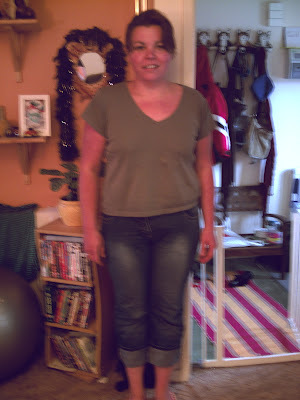 My goal, I think, will be 133lbs - just 38lbs away. I am hoping to step up exercising as I'd like what remains of my frame to be toned and to look as fit as it feels. My next major goal will be my 100lb mark at 148lbs. I'm hoping to be there by the end of September - particularly as I'm away on hols in August and I need a real incentive to remain on track while there!